Organic booze has, until now, always struck me as pretentious and a little silly. When you're drinking vodka, you're drinking a spirit so neutral that it could have been made from potatoes, wheat, rice or corn, and you probably couldn't tell the difference. Moreover, if you usually buy organic products for the health benefits, why are you doing drinking vodka? 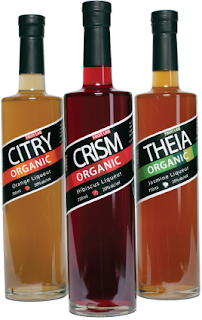 Now, though, there's a booze where organic ingredient sourcing makes sense: organic fruit liqueurs. I pay a premium for organic fruit for several reasons, but the main one is that I believe organically grown fruit has more flavor. So naturally I'd want that fruit going into a fruit liqueur. The citrus version is sweeter than Cointreau, Grand Marnier and the like, but that does make it easier for drinking straight or over the rocks. The lemony, yellow-grapefruit citrus notes do seem brighter and closer to real fruit than in the classic French versions -- maybe that's the organic fruit sourcing. It reminds me of a low-alcohol version of limoncello. (All of these are 20% alcohol.) This name, "Citry," isn't bad, a mashup of "city" and "citrus," which implies that this is how urbanites get their Vitamin C.
I don't care for the jasmine liqueur, which is way too sweet. I also wonder about why there's no one main brand name for the three of them. They're supposed to be called "Fruit Lab organic liqueurs" as a product lineup, but the words "Fruit Lab" are so tiny that you can't see them across a bar. The creators obviously think their weird individual names (Crism, etc.) are better for selling the product. That's strange, because in this company's original lineup, everything has essentially the same name, which seems like a better way of branding something new. Modern Spirits' founders, the husband and wife team of Melkon Khosrovian and Litty Mathew, are the folks who produce Tru organic vodka and gin. They're working to make their booze sustainable. The glass bottles are made lightweight, reversing the current packaging trend, and that delivers CO2 savings throughout the distribution chain. The labels are made from post-consumer waste paper and printed with soy ink. They also plan to donate 1% of sales to the Fruit Tree Planting Foundation, thereby combining do-goodism with creating new sources of materials, and why not? These liquors are available now in 40 states at $29 for a 750 ml bottle, which makes them a little cheaper than Chambord and Cointreau, a necessity for cracking the market. I don't know that getting a buzz off this stuff will help save the planet, but you might feel better about the hangover. Perhaps you'll find yourself saying, "Wow, I don't know where I was last night, and I can't get the taste of Crism out of my mouth." At that point you'll be glad it's organic -- and hibiscus.